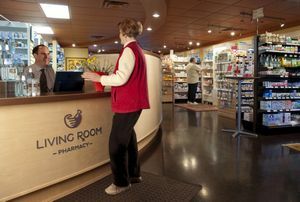 Living Room Pharmacy is a boutique pharmacy with full prescription service. It is independently owned and operated. We make independent choices on the products we sell, based on professional ethics and our customers' needs - not on what a far-away head office dictates. We offer full prescription service and a wide variety of products in order to make your life more comfortable. We hope you can be as comfortable navigating this site as you can be in our store. Feel free to call us if you'd like more information.